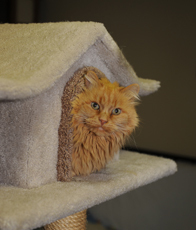 Cats are always welcome at the Sun Valley Animal Center Pet Ranch. We have a brand new, specially designed boarding loft just for cats. Each cat gets their own enclosure with an opening out into a large playroom. Just like the dogs, cats can have playgroups too. We also offer private cat boarding suites for cats that need a little more space. Staff members visit with the cats several times a day during their stay in the Cat Condos located at the Pet Ranch. We require a reservation for overnight visits. Please bring a current copy of your cat’s vaccination records. Please call the Sun Valley Animal Center Pet Lodge at 208-622-7387 (PETS) for accommodation choices, rates, and hours.